Four games left. Two against teams tied for first place in the MAC East. Two against teams with one combined MAC win. Even though the Bulls only have one MAC win, their fate is ahead of them. The schedule allows them to make up ground, which keeps the goal of winning the MAC East still in sight. The other goal of going to a bowl game is certainly in sight. But the margin for error is nearly gone. Which is why Saturday’s game at Akron is crucial. The Zips are 3-1 in the MAC, tied with Ohio for the East lead. A UB win gives the Bulls a potential tiebreaker edge over the Zips. That same tiebreaker advantage can come in the season finale against Ohio. As for a bowl, the Bulls will need to win three of the last four to get to six wins. A 6-6 record, while not a guarantee, is a pretty good bet to extend your season. So clearly, this is a big game against Akron. 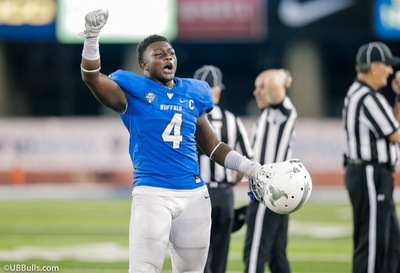 Bull Session Trivia: Khalil Hodge has 115 tackles, which is just 10 away from the UB FBS single season record. What former MAC Champion linebacker holds the record with 125 tackles? 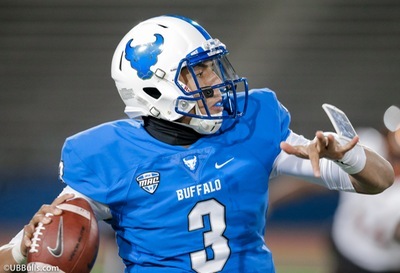 If you combined the stats of the Bulls three quarterbacks, that player would be second in the MAC in passing and third in touchdowns. That says the Bulls passing offense has been good all season no matter who’s under center…But you can’t create a QB named Tyree Anderson Vantrease. As of early in the week, Bulls head coach Lance Leipold declared Drew Anderson out, and said that Vantrease was working with the first team…The freshman’s debut was typical of a first time start. He made some good throws, but struggled to maintain drives. His fumble at the start of the second half was a key play of the game…The Bulls running game didn’t provide much help for Vantrease. For the third straight game, they failed to top 100 yards rushing. UB is averaging just 64 yards rushing over that stretch. But Akron has allowed a 100-yard rusher in six of their eight games…Kamathi Holsey had another big game, with 67 yards receiving and a 37-yard grab, UB’s longest play of the game…Anthony Johnson’s 6th TD catch of the year ties him for the MAC lead…He remains #1 in the MAC in overall catches and yards, and 4th in the NCAA in total receiving yards…Johnson is on pace to be just the 4th Bull to top 1000 yards receiving in a season…Akron’s key player on defense is linebacker Ulysses Gilbert. He is #2 (behind Khalil Hodge) in the league in tackles. Gilbert leads the Zips in tackles, sacks and interceptions…DE Jamal Davis leads the team with 8 tackles for loss. He’s a transfer from Pittsburgh…The Zips rank only 11th in yards allowed in the MAC. But they are #1 in red zone defense, and tied for 2nd in interceptions…They held Western Michigan to 13 points the week after the Broncos-Bulls 7 OT classic…Last week, Toledo ran for 303 yards against Akron’s defense. Hodge had another double-digit tackle performance at Miami, totaling 14. He’s had more than 10 in every game except one. Khalil remains tied for the national lead with Frank Ginda of San Jose State…UB’s pass defense continues to be a strength of the defense. They rank 2nd in the MAC, and 23rd in the NCAA…Even when Cam Lewis left with an injury, the cornerbacks continued their strong play. Brandon Williams, Tatum Slack, Devon Russell and Roy Baker have all been counted on for important snaps this season…At safety, freshman Kobe Green continues to get more snaps on defense. Also, Dev Lamour made his season debut at the position…Something will have to give in the ground game, as the Bulls defense has struggled lately but Akron’s rushing offense is ranked 115th in the country…The Zips did get a pair of 100 yard games early in the season from running back Warren Ball, the Ohio State transfer. But he got hurt and is out for the season…Van Edwards and Manny Morgan share running back duties, but neither of them have topped 100 yards rushing this season…The Zips have not had a 1000-yard rusher in Head Coach Terry Bowden’s five seasons…Thomas Woodson is one of only five MAC quarterbacks to start every one of their team’s games. He will make his 29th career start. Two years ago, he threw four TD passes against the Bulls. Last year, he was just 18/42 in the Bulls 41-20 win at UB Stadium…Four Zips receivers have 240 yards or more receiving this season. The top wide out is converted QB Tra’Von Chapman. His 32 grabs lead the team…Kwadarrius Smith has 22 catches, but averages almost 19 yards per receptions and leads the team with 4 touchdown catches…Lately, tight end Kobie Booker has become a bigger part of the passing game. He’s caught a scoring pass two weeks in a row…The Zips are the MAC’s second best third down team…They have scored on their first drive in five of their eight games. For what’s believed to be the first time in school history, the Bulls will start a game before Noon. The 11:30am start is unusual. It’s the only one in the MAC this season. Why? The game will be broadcast on the CBS Sports Network, as the first of a quadruple-header. In order to get four games in one day, with the last one starting at 10:00pm, the Bulls & Zips needed to get up early. A few UB coaches who spent time in the Midwest remember some 11:00am Central Time Zone starts for TV games. The Zips practice in the morning to accommodate class schedules, so they may be a bit more used to this. As for Bulls fans, grab some coffee and cook up some eggs. It’s Brunch with the Bulls! Bull Session Trivia Answer: Linebacker Justin Winters had 125 tackles during the Bulls 2008 MAC Championship season. It’s worth noting that Winters set that record in 14 games. Hodge could break it in his 9th game. Please join me, color analyst Scott Wilson, game host Brad Riter and postgame host Bob Gaughan for the “Brunch With The Bulls” broadcast on the Bulls Football Network. Our extended pregame show starts at 10:00am. You can hear it in Buffalo on ESPN 1520 and in Rochester on Fox Sports 1280. A link to the online broadcast is also available here and on the Tune In app.